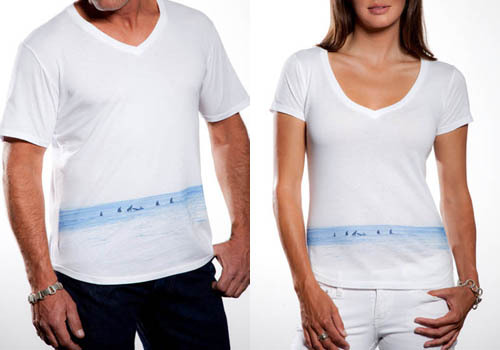 LOS ANGELES, Jul 13, 2011/ FW/ — With summer in full swing, +Beryll introduces its LA V-NECK “SURFERS” t-shirt which is made of of incredibly soft 100% supima cotton and features printed artwork by the designer himself, Sigmar Berg. The artwork mimics a typical sight on the California coastline, a strip of blue ocean against a sky of light. The epitome of surfer chic, this V-neck shirt can be paired with your cutoff denim shorts, distressed blue jeans, or crisp white skinnies. Wear it to the beach, the boardwalk or the BBQS as the essential summer outfit for both men and women. Handcrafted in Los Angeles. Available for purchase at select stores and online at www.beryll.com.